We’ve got our 2nd white label partner taking advantage of our advanced DNS support feature! 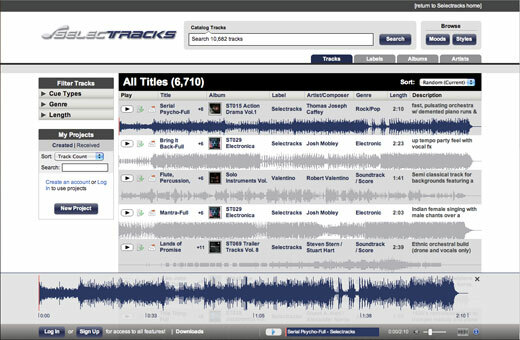 While the site, code, music and data are Source Audio-hosted, the site lives under the SelecTracks domain. Pretty cool. We can really point any URL (with proper access) at these white label partner sites making them look and feel like they’re truly integrated into each partner’s site. Our [dot]sourceaudio.com vanity URL’s are nice for some but for larger partners and brands, this feature becomes a necessity. We’re pretty excited about this custom offering. By the way, check out the new waveforms for all tracks on the site. They’re awesome. Not to boast, but they’re way better than all the others out there. They don’t get blown out to the point where they all being to look to the same. We really nailed these and the volume changes and variations are really noticeable and extremely accurate.